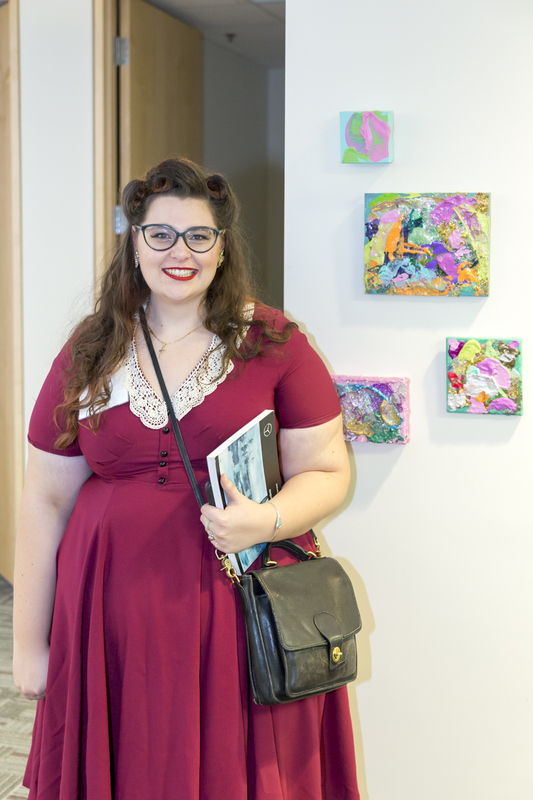 The eighth annual Experiencing Perspectives art exhibition at Mercedes-Benz Financial Services (MBFS) opened November 16 with a reception at the company’s Mississauga offices. Artists, MBFS staff and guests wandered the office space as though it were a gallery. 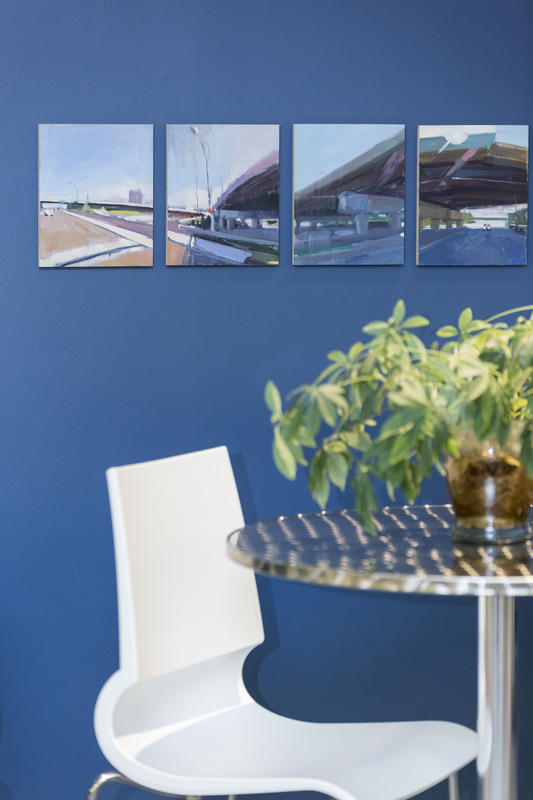 Over 90 works by students, faculty and alumni are positioned throughout the offices, corridors and boardrooms of the company with the goal of giving staff an inspiring, creative environment and appreciation of the work of emerging artists. The exhibition will remain in place for a year. 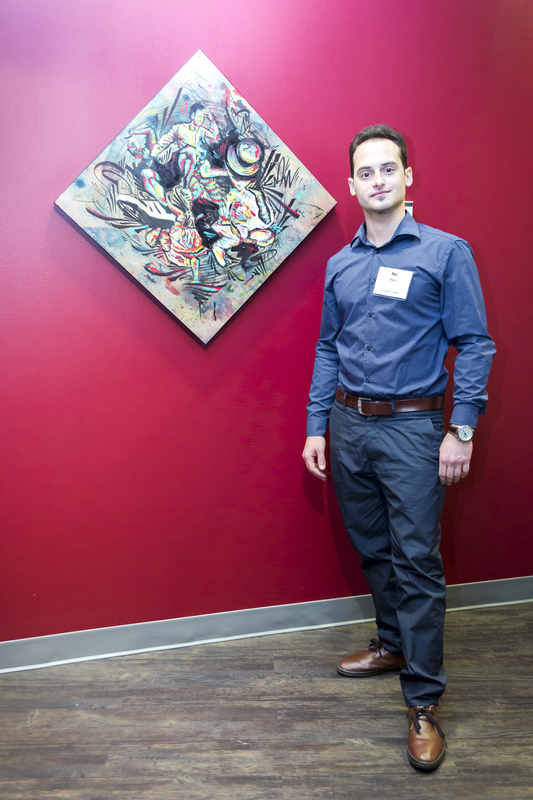 Stefan Karrenbauer, President and CEO of MBFS Canada announced that the Mississauga office made its fourth purchase of work for their permanent collection, a painting titled Vigilante (Watcher) by recent graduate Diego de la Rosa. The Art Gallery of Mississauga presents an exhibition of work by retired faculty member Viktor Tinkl, organized in collaboration with the Robert McLaughlin Gallery, Oshawa. Instructor Vessna Perunovich opens "Emblems of the Enigma" at the Art Gallery of Peterborough. This is the first stop in her 6-stop touring survey exhibition, curated by Donald Brackett. The exhibition will travel to Art Gallery of Mississauga, Art Gallery of Algoma and Cambridge Galleries in 2008, and Saint Mary's University Gallery in Halifax and Art Gallery of Kelowna in 2009. Staff at Mercedes Benz Financial Services (MBFS) in Mississauga took part in a unique digital painting workshop in November. OCAD University faculty member Veronika Szkudlarek, accompanied by student Dahae Song, visited MBFS offices for an exploration of the fundamentals of Digital Painting and Expanded Animation (DXPA). The workshop kicked off with an overview of the history of digital painting led by Szkudlarek. Song then presented a selection of her work, explaining the digital process and hybridized approach. The dozen MBFS staff who participated were delighted by the inspiring and interactive event. MBFS has partnered with OCAD U to bring creative thinking to the workplace and support the university’s contribution to the cultural community. Currently, 70 works of art by OCAD U students, alumni and faculty are on display at MBFS in the Experiencing Perspectives exhibition. The company generously supports OCAD U through awards, scholarships and the funding of the Drawing & Painting graduate catalogue. Ninety-nine works by 74 OCAD University students, alumni and faculty were unveiled October 21 in the Mississauga offices of Mercedes-Benz Financial Services (MBFS). At the opening of the Experiencing Perspectives exhibition, President and CEO Stefan Karrenbauer thanked the artists for bringing creativity and art appreciation to the workplace. OCAD U alumni from the class of 1971 to the class of 2015 were in attendance, mingling with MBFS staff and invited guests. This is the seventh annual exhibition in the series, and for the past three years MBFS has been purchasing art from these exhibitions for its permanent collection. The company has similar initiatives with art schools in Farmington Hills, Michigan, and Fort Worth, Texas. Experiencing Perspectives was made possible through the Faculty of Art’s Associate Dean, Outreach, Anda Kubis; Natalie Waldburger, Ada Slaight Chair of Contemporary Painting and Print Media; and Assistant Professor Jennie Suddick. The art will remain in place for a year. OCAD University is grateful for the generous support of Mercedes-Benz Financial Services which includes The MBFS Direct Entry (to Drawing & Painting) Scholarship, The Drawing & Painting Medal winner award, and funding the DRPT graduate catalogue for the last seven years.